The 2019 Fieldays app is available from the iTunes store and the Google Play store. Fieldays has made significant changes to the Fieldays App for both iOS and Android versions, so please ensure you have updated/refreshed the version of the app you have on your phone. There is so much to see and do at Fieldays and the Official Fieldays App makes it easier, faster and more reliable to plan your trip and get around. 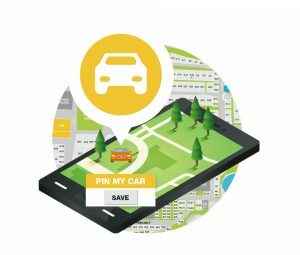 Locate and route to all the essential services, search and find exhibitor sites and event times and locations. Select your favourites list and view your selection on the interactive map. Zoom in on the map and tap on a site to view exhibitor details and start your route. You must accept the following terms and conditions to participate in the Fieldays Suzuki App promotion. By entering into the competition, you confirm that you accept these terms and conditions. 1. The Promotion commences at 12.01am on 11 May 2018 and continues until midnight on 16 June 2018 (Promotional Period). No entries will be accepted outside the Promotional Period. 2. The competition is only open to users who reside in New Zealand. 3. To enter the Competition, you need to register and provide accurate and complete details. When you register to participate in the Competition, you will be obliged to click a tick box confirming that you have read, understood and accepted these Terms. 4. The Promotion is limited to one entry per person during the Promotional Period. 5. Entrants need to download the ‘Fieldays App’ to be considered eligible to go in a draw. Winner will need proof of this in order to collect their prize. 6. To enter, download the ‘Fieldays Live’ App on your smart phone and complete the registration page. 7. The New Zealand National Fieldays Society reserves the right to amend these Terms and Conditions at any time. 8. New Zealand National Fieldays Staff, Volunteers and their immediate families are not eligible to win. 9. Apple and Google is not involved in any way with the Suzuki Fieldays app Prize. 1. 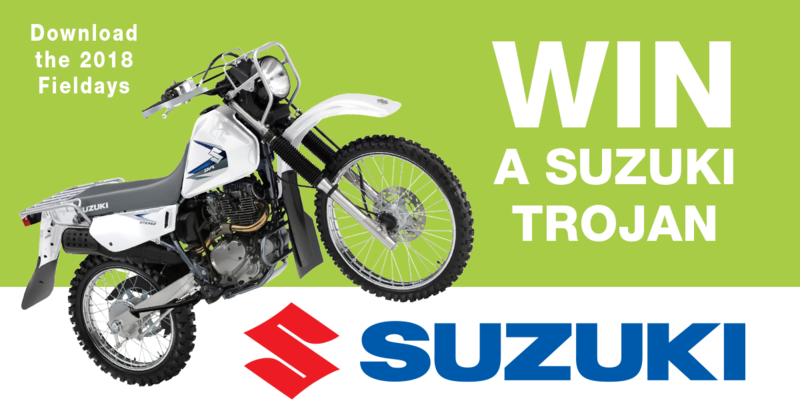 The prize winner will receive a receive a Suzuki DR200SEL5 TROJAN. RRP $5995 incl GST. 2. The winner will be notified as soon as possible following the draw. Reasonable efforts will be made to contact prize winners using the information provided. The New Zealand National Fieldays Society reserves the right to redraw if a winner cannot be contacted within a reasonable period, as determined by the Society. 3. The New Zealand National Fieldays Society reserves the right to substitute to a similar alternative of equal or greater value in the event of circumstances outside its control. 4. The New Zealand National Fieldays Society adheres to all applicable privacy laws and regulations. 5. The prize is taken entirely at the prize winner’s own risk.